Research firm Canalys Thursday offered data on first-quarter smart mobile device shipments, with an estimated 300+ million new units for a 37.4 percent year-over-year growth. Google’s Android powered 59 percent and Apple’s iOS powered a little over nineteen percent of these devices, according to researchers. Key takeaways: Android leads the smartphone race, Apple is holding onto the tablet market and laptop demand continues falling. 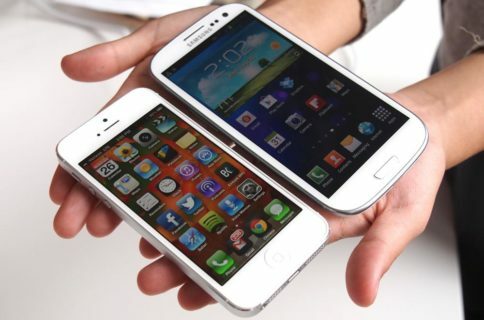 Overall, Samsung shipped 82.2 million units, accounting for a 26.6 percent share of the total smart device shipments. 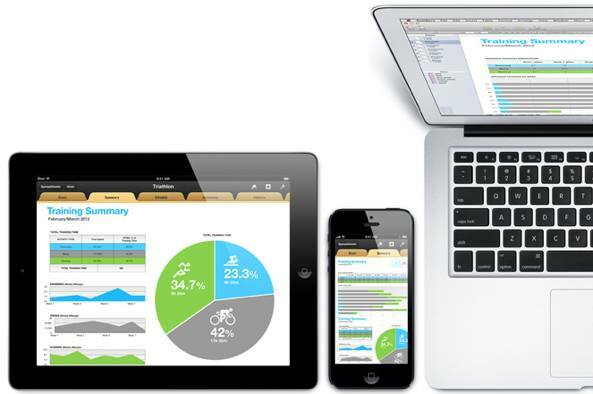 Apple shipped 59.6 million smartphones, tablets and notebooks, taking home a 19.3 percent share. 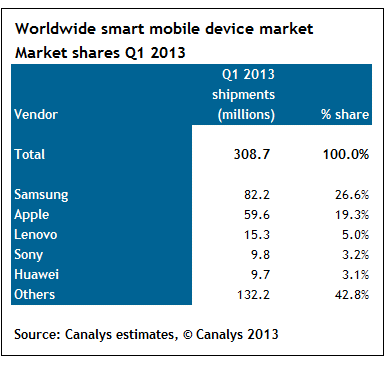 Lenovo, Sony and Huawei round up the top five with their respective 15.3 percent, 9.8 percent and 9.7 percent share. Numerically, smartphones topped the list of smart devices, shipping 216.3 million for a healthy 47.9 percent quarterly growth, according to the Canalys report. In terms of rocketing growth, tablets took the spotlight. Demand for slates such as Apple’s iPad saw shipments rise 106.1 percent year-over-year to 41.9 million quarterly devices. Apple itself reported selling 19.5 million iPads in the first three months of 2013. By contrast, Q1 shipments of notebook PCs saw a 13.1 percent decline to 50.5 million units. At that negative pace, tablets could soon outnumber notebooks shipped as PCs become trucks (NPD thinks the iPad will displace the laptop by 2016). Although the tablet market is red-hot, Apple’s commanding 46.5 percent lead may be in jeopardy as the avalanche of inexpensive Android tablets enables the Android camp to nip at the iPad’s share for the third straight quarter. The problem is that Google and Amazon have dropped prices so low that “the commoditization of the tablet market has happened far quicker than that of the wider PC market,” according to Canalys analyst Tim Coulling. Tablet vendors must increasingly rely on an ecosystem of accessories, software and services to balance the falling tablet hardware revenue, all areas where Apple excels. 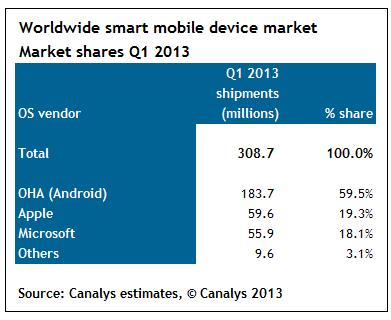 Canalys estimated Android now controls 75.6 percent of the smartphone market. This can be largely credited to South Korea’s Samsung, which saw 64.3 percent increase in shipments, good enough for a 32 percent of the smartphone market. By comparison, Apple shipped 37 million iPhones during the first three months of this year, representing a modest 6.7 percent growth, the lowest since the handset first appeared in 2007. The next iPhone – which could appear in September – is expected to include a larger display. However don’t expect a phablet-style iPhone, Cunningham said. While interesting, the Canalys numbers account only for devices shipped, not sold. Just as we’ve noted there is a sharp difference between Android and iOS usage patterns, the same is true with shipped versus sold.